I have been a Star Trek fan for nearly as long as I can remember. My very first memories don’t actually involve Star Trek, but that probably means I’m remembering wrong. Star Trek was really the beginning of my long term involvement in geek culture. I’ve seen all of the movies and nearly every episode, some of them many, many times. At some point, I have come to know the villains almost as well as the heroes. While the Klingons are great and I love me some Borg, no other villain ever quite measures up to the ultimate Trek villain: Khan Noonien Singh. “The villain has evolved so much over the course of the series, reappearing regularly—whether Trekkies want to see him again or not. 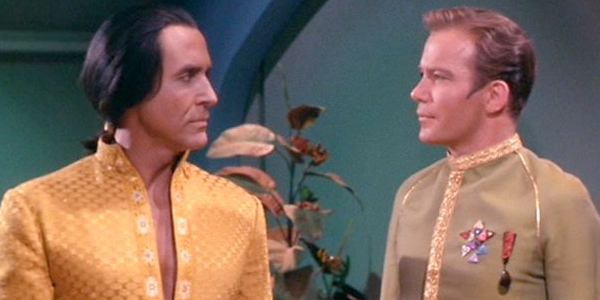 Khan first appeared in the Original Series episode Space Seed, portrayed by actor Ricardo Montalban, when he was discovered adrift aboard the SS Botany Bay by the Enterprise. Kirk and company quickly discovered his real identity as one of the unaccounted for super-humans that escaped Earth in 1996 in cryogenic freeze (by the way, where is that technology? It’s 2013!). Khan is shown to be incredibly self-confident, frequently bordering on arrogant, charismatic and yet inhumanly cold. Anything that he deems to be beneath him or a waste of his time he simply disregards, often cutting people off midsentence, absurdly claiming fatigue. Not only is Khan intelligent, but he is also unbelievably manipulative. In forty-five seconds with Lt. McGivers, an entire emotionally abusive relationship unfolds from his initial reverse psychology to full-blown sadistic exploitation! (Check it out for yourself! http://youtu.be/UCMyxPSMxrA) Additionally, Montalban presents quite an imposing physical figure. He is very fit and trim, providing a strong representation of what an idealized human might look like, at least to 1960 America. Tall, dark, handsome, and regal, Khan represents a counter to Kirk’s swashbuckling swagger. Say what you will about Bill Shatner now, in the first season of the Star Trek he was pretty attractive guy. Khan presents an example of what a superhuman should be on the outside, but inside he is very much inhuman. In the end, of course, the crew of the Enterprise won the day and Khan was left on a planet to fend for himself and his crew. A week ago Star Trek: Into Darkness came out in theatres, and much to the chagrin of long time Trekkies, the main antagonist turns out to be Khan once again. This time the role is played by wonderful actor Benedict Cumberbatch, of BBC’s Sherlock fame. Cumberbatch’s Khan is very different than that of Montalban. Where Montalban’s Khan was physically the epitome of a superhuman but cold, aloof and inhuman mentally, Cumberbatch is emotionally quite human, expressing a full range of emotional states including showing concern and compassion for his crew members—something that Montalban’s character never did. Cumberbatch is also an interesting choice because he does not fit the stereotypical mental image of the perfect human. In fact he even looks a little alien, as was pointed out to me by another review. He is certainly fit, and he does have a distinct and slightly creepy screen presence, but lacks the commanding presence of Montalban. This characterization of Khan also played up his sheer intelligence, thinking and acting faster than almost anyone else on screen. I found a bit of overlap between Cumberbatch’s Khan and his Sherlock Holmes but certainly nothing that takes away from his characterization of either. I have to say that for my money, nothing beats the Star Trek II Khan. Like I said, I grew up on Star Trek and Montalban’s Khan is one of my all-time favorite Sci-Fi villains—certainly in the top five. A large part of the reason that Star Trek II is the best of the Star Trek movies is Khan’s character. He is just a cut above the rest (and with a big, muscled rubber chest piece, how could he not be?). The other part is definitely big space ships beating the crap out of each other. I can’t help it. In the end, I can appreciate and enjoy whichever Khan happens to be on the screen in front of me, and I can’t wait to see what the future holds for Star Trek. I’ve seen a few of the older Star Trek episodes, but most of my experience has been with the two newest movies. I think I’ll have to start watching the older movies and shows now!